You need to meet the following requirements to run the samples below .. In the following tutorial I am using the Java Persistence API as abstraction to the persistence layer with Hibernate 4.0.1 as persistence provider and for the sake of lazyness HSQL as a database. 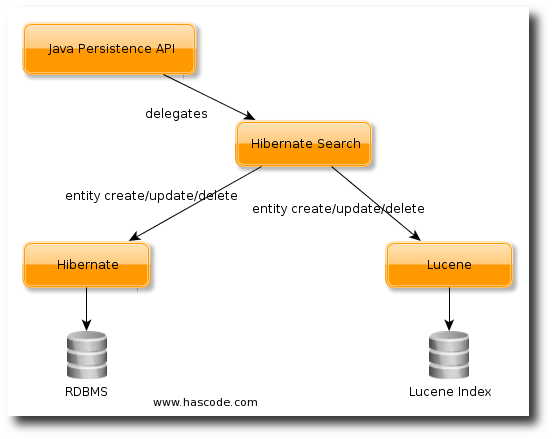 Hibernate Search 4.0.0 is added and brings Lucene 3.4.0 with it. Now that we’ve got all dependencies needed we’re building a simple proof of concept: We’re building an application that persists some books and afterwards searches for a given criterion using both possible ways – via Lucene query and via JPA JPQ query.. Create a new file named persistence.xml in the directory src/main/resources/META-INF to adjust the JPA persistence settings. For some more detailed information about possible Hibernate Search configuration parameters, please take a look at this chapter from the official user reference. 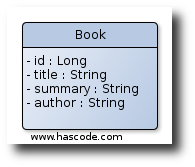 Create a new class named Book, use the common JPA annotations to configure JPA and afterwards configure the indexing using the annotations in the org.hibernate.search.annotations package. The basic annotations used here are @Indexed - this one is needed to declare an entity to be indexed and @Field to adjust the index settings for specific fields. Now we’re ready to persist and index some of the entities created above. As you can see, in the first step we’re initializing the usual JPA context, the EntityManagerFactory, EntityManager and the Transaction. Afterwards we’re creating three book entities and persist them. 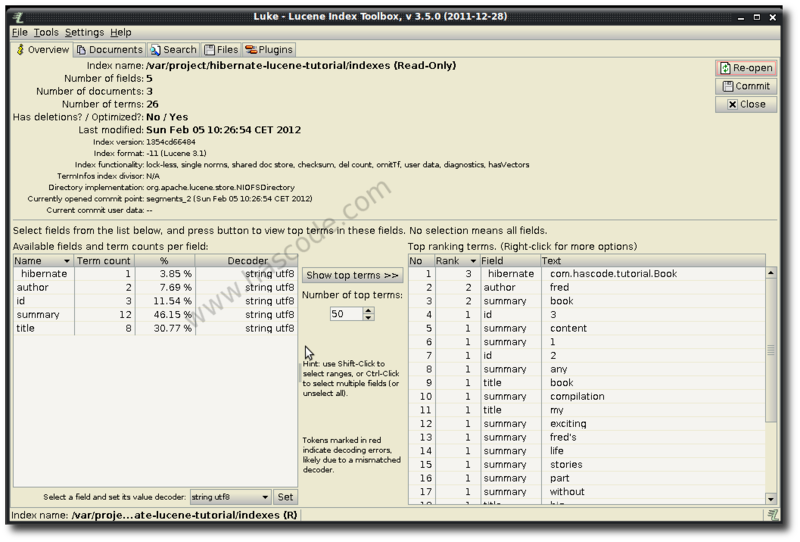 Afterwards we’re searching for all books from the author named “fred” – first using a Lucene Term Query and second using a JPA JPQL query. 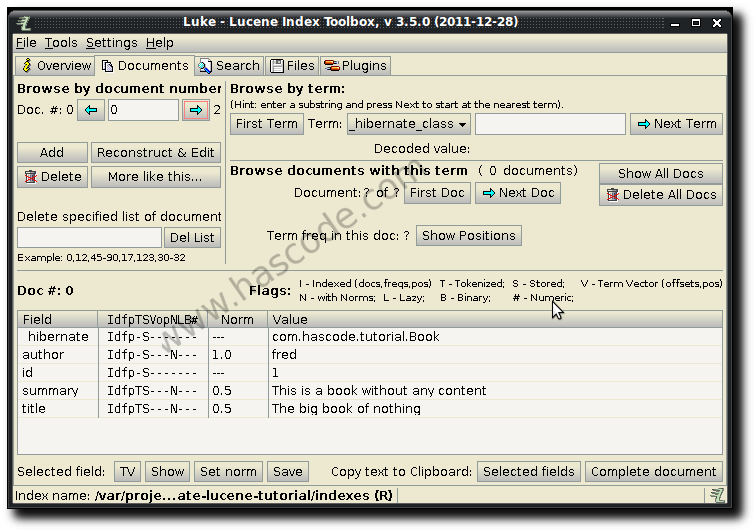 System.out.println("title: " + b.getTitle() + ", summary: "
Last but not least we’re going to take a look at the created Lucene index – I am using Luke – the Lucene Index Toolbox here.. This entry was posted on Sunday, February 5th, 2012 at 12:54 pm	and is filed under Java. You can follow any responses to this entry through the RSS 2.0 feed. You can skip to the end and leave a response. Pinging is currently not allowed. Great introduction. Could you give more advanced example with full-text-search and document parsing(XML, PDF etc.) ? In retrospect I could have used a WildcardQuery, PhraseQuery or FuzzyQuery instead of a simple TermQuery to demonstrate the advantage of Lucene in the example.